life-enhancing lessons that come from engaging in athletics and recreational activities. The Kernels Summer Reading Program celebrated its 20th Anniversary in 2018! 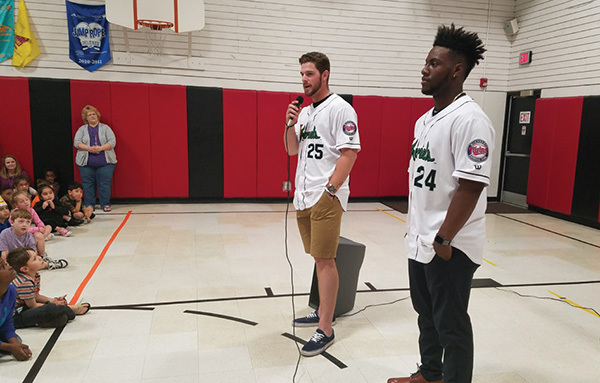 For the last two decades the Cedar Rapids Kernels have visited elementary schools with the sole purpose of getting kids excited for reading. In 2018, from the months of April, May and June, Kernels staff held 60 elementary school assemblies where kids across Eastern Iowa learned why reading is so important while having fun listening to the story "There is a Bear on My Chair." 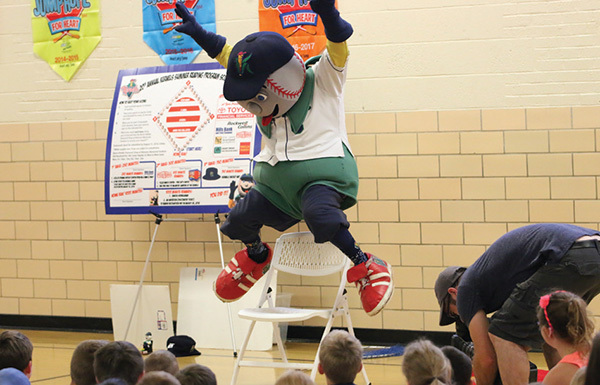 Kernels players and our mascot Mr. Shucks made the kids roll with laughter by acting out the story with funny dance moves and antics. Thank you to presenting sponsor Toyota Financial for sponsoring our reading program from day one! 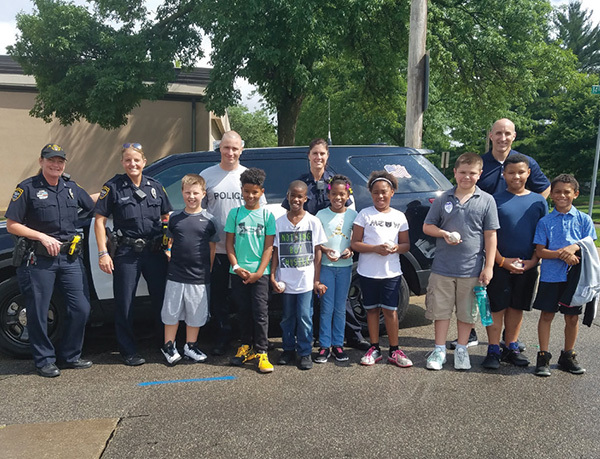 The Cedar Rapids Kernels partnered with the Cedar Rapids Police Department, Jane Boyd Community House and Kids on Course University in 2017 to create a new youth program called "Catch with a Cop". Branching from the success of "Coffee with a Cop", we wanted to connect the youth of Cedar Rapids to local police officers to start a positive and engaging relationship with a simple game of catch! With the help of community leaders such as Megan Isenberg from Jane Boyd, Amy Evans from Kids on Course and Shannon Sampson from the Cedar Rapids Police Department, "Catch with a Cop" entered it's second year with continued success! The Al Smith League of Dreams is an instructional, non-competitive, coach-pitch league open to local 2nd and 3rd graders. With the help of Minor League Baseball, Perfect Game USA and Rawlings, we are able to provide almost 100 boys and girls a free baseball program. Some children in the "League of Dreams" may not have the means to play baseball, while others are playing for the first time ever. In 2018, 11 elementary schools participated and played a total of 32 regular season games in the month of June. Despite 3 rainouts, the "League of Dreams" kids had a blast playing baseball and were later invited to a special All-Star game hosted at Veterans Memorial Stadium. All the kids got the wonderful opportunity to play on the same field as the Kernels! Their families were invited to cheer and were served free food, free drinks and were given a free ticket to a Kernels game all thanks to the Kernels Foundation. Nick Adenhart was a bright young pitcher who played for the Cedar Rapids Kernels in 2006, and was a rising star in the Los Angeles Angels organization. Only hours after Nick's 2009 season debut on the mound for the Angels a drunk driver killed him tragically at the age of 22. Nick's family continues to honor him with the awarding of two $1,000 scholarships in his memory. 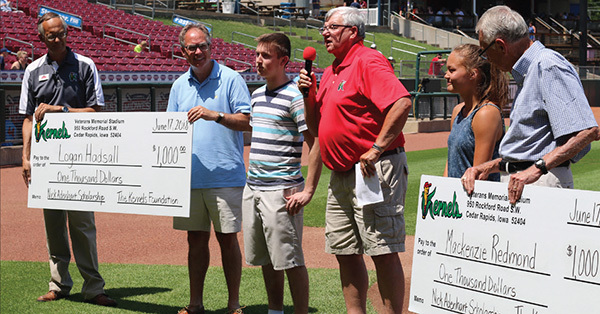 The Kernels Foundation is privileged to administer the scholarships on behalf of Nick's family. Scholarship applications for the 2019 Nick Adenhart Memorial Scholarship are now open and the submittal deadline is April 13, 2019. Click here for more information and to download an application form. First Federal Credit Union and the Cedar Rapids Kernels created the "Home Run for Hunger" program in 2017 which is a collaborative initiative to support the Hawkeye Area Community Action Program (HACAP) Food Reservoir. Volunteers from First Federal Credit Union and the Cedar Rapids Kernels visited 7 farmers' markets over the summer and collected 3,420 pounds of food from local vendors for HACAP's food reservoir. In two years, "Home Run for Hunger" has collected over 7,000 pounds of food for people in our community fighting hunger every day. The food collected is distributed right away to 7 surrounding counties and has been used in programs such as "Meals on Wheels". For the second year in a row, First Federal Credit Union and the Cedar Rapids Kernels were awarded "Best Partnership in 2018" by HACAP. If you would like to donate to the Kernels Foundation, click here to download a donation form.